NEW YORK, Nov. 3, 2016, SOUP, /PRNewswire/ — (Public Trading Symbol: OTC-PINK: SOUP) Soupman, Inc. (www.originalsoupman.com) announces the roll-out of its Chicken Gumbo at Costco (www.Costco.com) stores in Ohio, Michigan, Kentucky, Indiana and Missouri. This tasty soup was recently featured on the Food Network hit show UNWRAPPED 2.0. This Soupman soup is slow-cooked and loaded with plenty of chicken, okra and Al’s unique spice blend. All Soupman soups are sold in environmentally friendly, “green” Tetra Pak cartons which are designed to keep the product fresher. Soupman soups are available next to Campbell’s and Progresso in the soup aisle of other fine retailers, including Kroger, Safeway, Publix, HEB, Shoprite, Acme, Shaw’s, Price Chopper, Winn Dixie and many more. In 1984, The Original SoupMan® opened its doors at 55th Street & 8th Avenue in Manhattan and quickly became a worldwide destination. Rated #1 by Zagat and praised by the New York Times as “Art, not Soup,” it set the standard for innovation and excellence long before the famous “Seinfeld” episode made it a cultural icon. We sell soup across America in Tetra Pak cartons in grocery stores next to Campbell’s and Progresso as well as in our franchise restaurants, soupmobiles and foodservices. Shaquille O’Neal is an advisor and equity partner, as are Mr. October, Reggie Jackson and the award-winning actor, Jason Alexander. 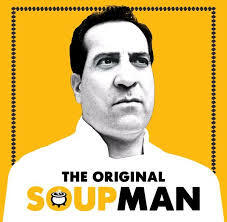 Soupman Inc., is a fully reporting public company trading under the symbol SOUP. For additional information on our company please visit: www.originalsoupman.com Follow us on Twitter @OriginalSoupMan and “Like” us on Facebook.